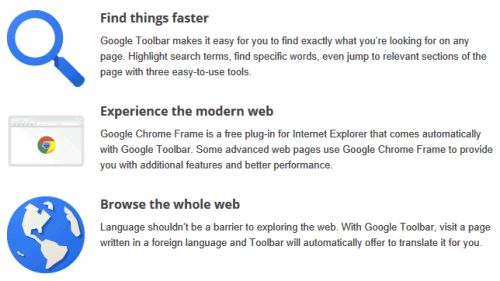 If you install Google Toolbar for Internet Explorer, you may notice that Google installs an additional software: Chrome Frame. It's a plug-in that renders some pages using Chrome even if you use Internet Explorer. Web developers can add a meta tag that enables Chrome rendering if Chrome Frame is installed and that's especially useful if a page uses technologies that aren't supported by Internet Explorer (for example, HTML5 video in IE6, canvas in IE7, SVG in IE8). "Google Chrome Frame seamlessly enhances your browsing experience in Internet Explorer. It displays Google Chrome Frame enabled sites using Google Chrome's rendering technology, giving you access to the latest HTML5 features as well as Google Chrome's performance and security features without in any way interrupting your usual browser usage," explains Google. There are many Google services that use Chrome Frame: Google Calendar, Google Drive/Docs, YouTube and more. Now that Google Apps dropped support for old IE versions (IE6 - 2010, IE7 - 2011, IE8 - November 2012), Chrome Frame is the only way to use Google Apps if you can't update to a new IE release or switch to a different browser. To see if Chrome Frame is installed, you can go to a site like YouTube or Google Calendar, right-click and see if there's a menu item called "About Chrome Frame". Another option is to type gcf:about:version in the address bar and see if a similar page is displayed. To uninstall Chrome Frame, "use the standard Add or Remove Programs tool in the Windows Control Panel (called Programs and Features in Windows Vista and Windows 7)". It's not clear if Chrome Frame is only installed for new Google Toolbar or if the future updates will also include Chrome Frame. Google is intentionally dropping support for Internet explorer to push Chrome. Internet Explorer 8 is still a new browser as far as Non-geek peoples are concerned that ships with Windows 7. The good example is Google Currents that only run in Chrome and when you you change user agent of Firefox to chrome that works fine without any problem then why Google force to use Chrome for Google currents? As for "new browser", IE 9 is offered to all Windows Vista and Windows 7 users through the operating system's update facility. As for user agent lockout, no amount of user agent change will get IE 8 to fully support the canvas element or CSS3 media queries apart from using a BHO like Chrome Frame. IE8 is in no way, shape or form a new browser. Not only is it three years old, but it was outdated when it launched as well. It's a relic, and it's very progressive and forward-looking to drop support for it.